The menu included an endive and apple salad, artichoke risotto and porchetta, which was my major achievement. For dessert, I made bourbon panna cotta with honey walnuts. Since porchetta is a pork loin wrapped in a large portion of pork belly, I had a slight hiccup in that I couldn’t find a large enough piece of belly. I was looking for about a four-pound slab, and the Dekalb Farmer’s Market shockingly didn’t have a piece that large. 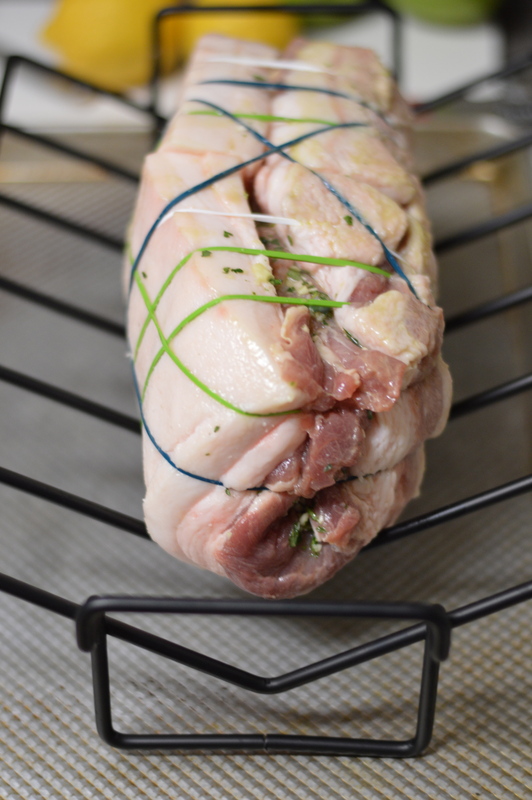 I ended up getting two halves of one large piece that joined together pretty easily – I just had to tie the assembled porchetta lengthwise in addition to the traditional crosswise bindings. And I actually didn’t tie anything; I recently discovered these little rubber bands made of silicone that can stand in for cooking twine. These little thingies take a lot of guesswork out of binding together big cuts of meat, and I’d highly recommend using these if you’re making anything like a beef tenderloin or a crown roast. Another nice thing about making a large roast like this is that you do most of the work the night before. If you’re having guests over, you don’t want to be busy in the kitchen ignoring them the whole time. Almost all the prep work for this porchetta happened the night before; I just threw it in the oven for a couple of hours on Saturday evening. I also made dessert the night before. 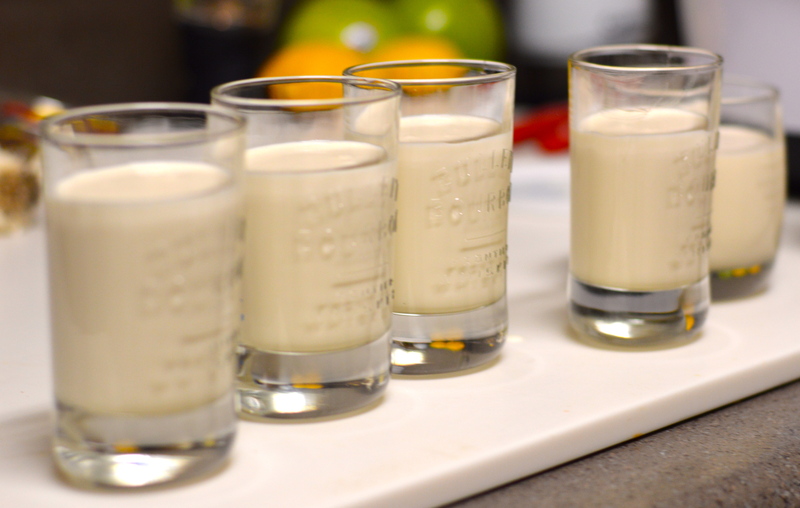 I used a recipe for Greek yogurt panna cotta that I modified by adding a little vanilla extract and some reduced bourbon. When I was ready to serve, I just sprinkled my little individual servings with walnuts and honey and had nice, effortless dessert that offset the richness of the main dish. As for my other tip – make sure you are familiar with the dishes you will serve as sides. Mashed potatoes, rice, pureed or roasted vegetables and other reliable recipes are great supporting characters. The majority of your effort should be put into the main entree. Or, have your friends bring the sides if you’re not a self-serving cook throwing a dinner party for your blog. 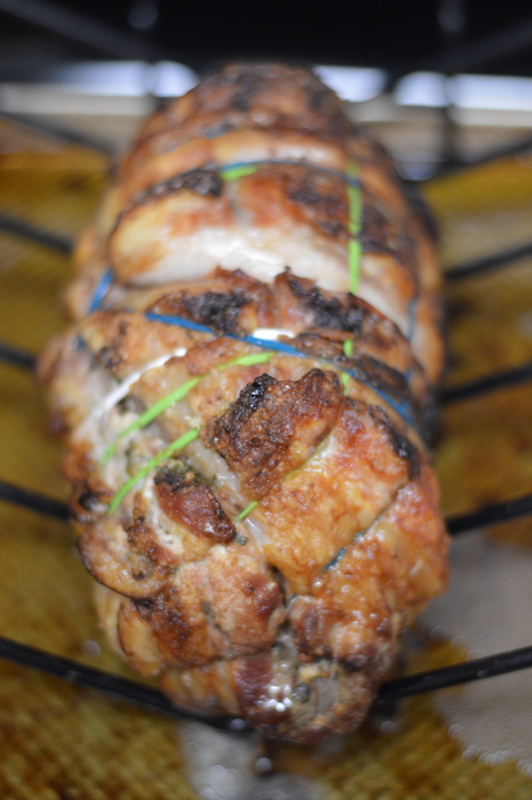 And now, here is the recipe for my version of porchetta! Lay pork belly skin-side down. Score the meat about 1/3 inch deep in a crosshatch pattern. Turn it over and poke holes all over the skin. Flip it back over one more time and rub all over with a liberal amount of salt. Finely mince the herbs and garlic, then whisk in the lemon juice and olive oil. Or, take the easy route and pulse all ingredients in a food processor or blender. Rub the herb and garlic mixture all over the meat side of the pork belly. Lay the pork loin in the middle of the pork belly; if either piece of meat has thicker sections, try to pair those with the less thick section of the other piece. In other words, try to put the tail of the loin on the thicker side of the belly. This will give you a more uniform shape when you tie everything together and result in more even cooking. Bring the sides of the pork belly to each other, wrapping it fully around the pork loin. Slip the silicone rubber bands around the whole assemblage, spacing them about an inch or an inch and a half apart. Alternatively, tie cooking twine tightly around the meat at the same interval. 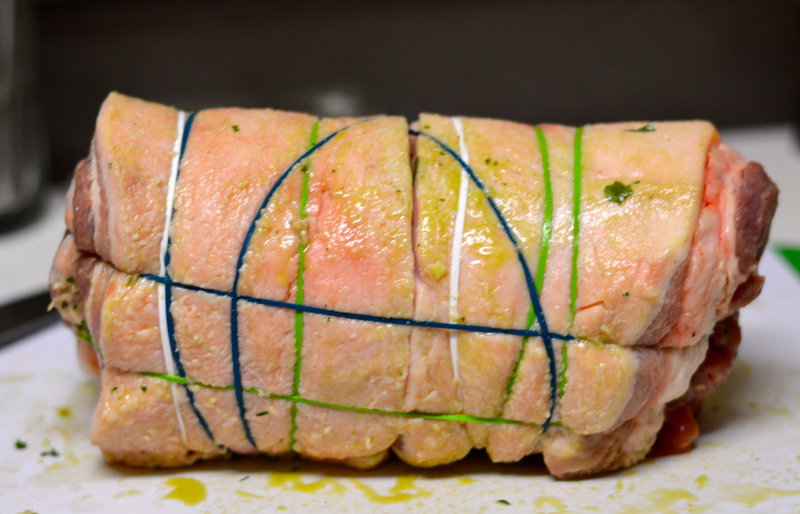 Place the assembled porchetta on a roasting rack and into the fridge for several hours or overnight. Take porchetta out of the fridge an hour before you’re ready to cook it. Preheat oven to 500 degrees. Roast the porchetta for 40 minutes at 500 degrees, turning once after 20 minutes. The meat should be well browned all over. Reduce heat to 300 degrees. Cook pork for an hour and fifteen minutes to an hour and a half, turning it at regular intervals, every twenty minutes or so. When the internal temperature of the porchetta has reached 145-150 degrees, remove it and let it rest for half an hour or so. Slice into 1/4 – 1/2 inch pieces crosswise and serve warm. Henri, Would you be available to cook for travel club this April? We enjoyed all your posts this year. Congratulations.